In my final Isle of Skye blog I’ll be reviewing Cafe Sia, a place that had been recommended to me as a sensible eating experience while in Broadford. I’m not a great one for recommendations but the opportunity of a bit of Haggis pre-race filled me with a childish glee and you’re right I don’t normally bother with food reviews on my running blog because it’s a running blog but when somethings worthwhile, well it’s worthwhile and I think this is worth sharing. All in all I ate four times at Cafe Sia across a four day period with the whole of Saturday being taken out by the Skye Trail Ultra and Sunday lunchtime taken out by being asleep. The setting for Cafe Sia is a little way back from the main through road of Skye with around 60 covers. There’s some pleasant bench style seating on the exterior and the inside is an eclectic mix of dark wood and soft furnishing – it’s cosy and stylish but not at the cost of being friendly. Perhaps the word I’m looking for is cosmopolitan but that’s not right either, perhaps it’s best described as ‘uniquely itself’ and all the better for it. When I first arrived I was offered the choice of the available tables and I took one near the rear of the building next to a door with a gentle breeze and a clear view of the kitchen. On the main bar there were staff hanging out, delivering orders and operating the large wonderful smelling coffee machine, to the far side was a collection of delicious looking cakes. I browsed the menu – supplied on a clip board – just gimmicky enough to be cute but retain its practicality. I chose the thing on the menu I had come here for – The Highland Melt and dipped up to counter to order. I ordered my sandwich alongside a thick tasty chocolate milkshake and soon I was greeted by the sight of bread, cheese and haggis served on square slate plates with a small but perfectly formed dressed side salad. This was the Haggis elevated to a new level of delight. Being hungry I devoured the lot in mere seconds, thanked my excellent hosts and departed but I’d be back. Post race briefing I decided I needed something for dinner before I grabbed some sleep in preparation for the Skye Trail Ultra. I did check out the fish and chip shop but didn’t fancy anything on offer – although it did smell delightful. Instead I meandered back to Cafe Sia and ordered the fabulous Raspberry Ripple milkshake and what was pleasantly misleading described as a fish finger sandwich. I sat alone outside on the decked seating area and again enjoyed the surroundings and my food. I’d only wanted something light and this was perfect just a few hours before the race. It would be another 38hrs, a 74 mile race and a Flash Gordon adventure before I would return and it was a triumphant return. I ambled in with my hiking poles – which although I couldn’t use them in the race I could use to get me round Skye – and was offered one of the few seats remaining, it was a nice window seat with more than enough room for me to spread out and also quietly observe the busy restaurant around me. Even on a busy night like this and on my own I didn’t feel uncomfortable or unwelcome. 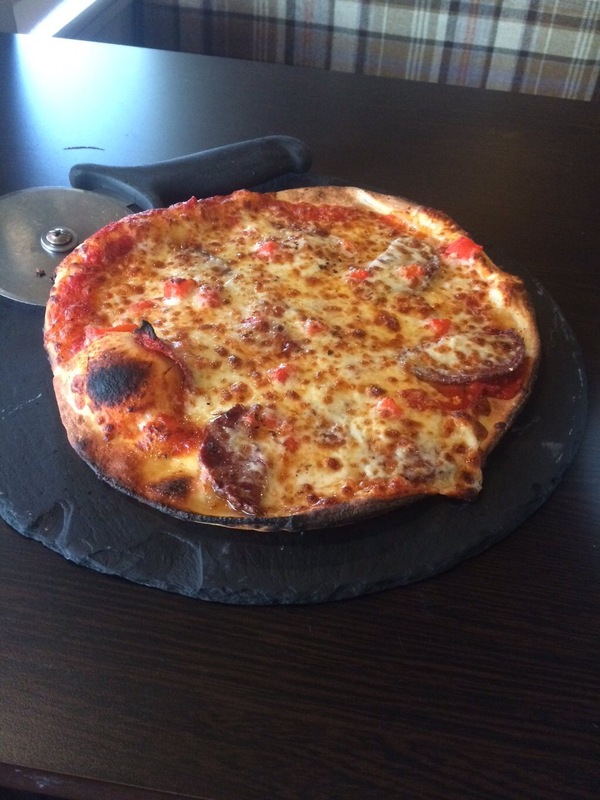 Service was as excellent as my previous visits and I ordered the hottest pizza on the menu with scotch bonnet chilli and spicy Scottish sausage with thick tasty tomato sauce and enough cheese to make it feel hearty. I added a large portion of potato wedges because I felt I’d earned them and an ice cold Irn-Bru (otherwise known as the drink of champions). What surprised me was just how hot and spicy the pizza was yet retaining all the flavour I was hoping for, this was a considered flavour combination and I hoovered the pizza up with my post race runger – I knew I’d had something special, plus I’d eaten like a king for less than £20. I went back to my accommodation that night, my hunger truly sated. Having packed up that evening I realised that my bus stop for the journey back to Inverness started outside Cafe Sia, I therefore took the opportunity to dip inside and enjoy a leisurely breakfast. I was asked very politely if I’d mind leaving my gigantic rucksack outside in the porch area, which I happily did as you really don’t want to be tripping over bags. I settled on the Eggs Benedict and a flat white – the smell of the freshly ground coffee had been luring me in all weekend. Of course I added in a final chocolate milkshake too and I sucked deeply on the milkshake straw and as I did the events of the weekend flooded back in my mild head freeze. Skye had been amazing and Cafe Sia had played a significant part in that. As you might expect giving my glowing experience of Cafe Sia the eggs benedict lived up to my expectations – they were a freshly cooked class act. I shan’t attempt to convey the taste but if I simply say ‘Yum’ you probably get the meaning. A second cup of the delicious coffee followed and my culinary journey in Skye was complete. In conclusion I can say, without reservation, that food in Scotland, or at least at Cafe Sia is a delight. The Isle of Skye has a little gem that is as popular with the locals as it is with the visitors such as myself. If you’re in Broadford then the foody delights at this hotspot could power you up some hilly climb, help you recover from your exertions or simply serve you some outstandingly delicious nosh. Now importantly, while the food was exceptional there was a thing that bettered it – the service. During my various visits the service was always warm and welcoming but also professional – let me assure you many a decent London restaurant could learn a thing or two from Cafe Sia regarding service. So what are you waiting for? I’ve given you three great reasons to visit the Isle of Skye – ultra running, great food and Flash Gordon – enjoy! N.B. During high season its recommended to book for the evening meals but believe me it’s worth the booking. Bon appetit!